The European Union is in the center of a wide-ranging debate over its future. 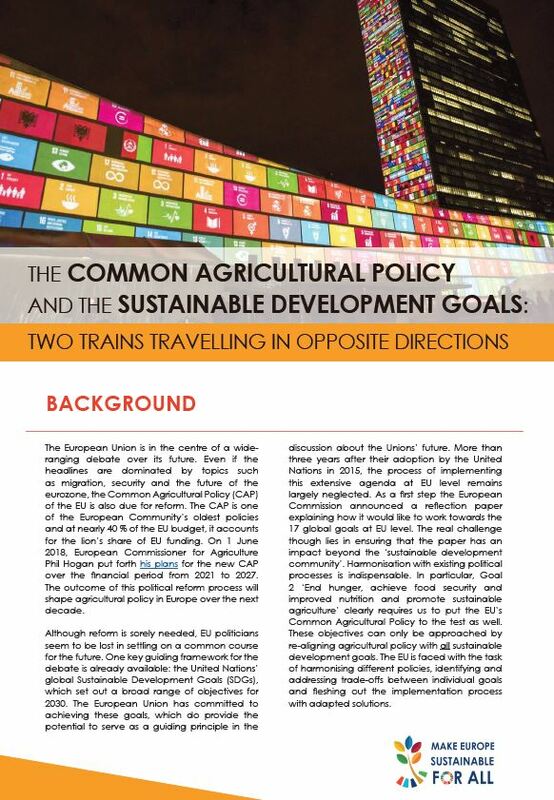 Even if the headlines are dominated by topics such as migration, security and the future of the Eurozone, the Common Agricultural Policy (CAP) of the EU is also due for reform. The CAP is one of the European Community’s oldest policies and at nearly 40 % of the EU budget, it accounts for the lion’s share of EU funding. On 1 June 2018, European Commissioner for Agriculture Phil Hogan put forth his plans for the new CAP over the financial period from 2021 to 2027. The outcome of this political reform process will shape agricultural policy in Europe over the next decade. us to put the EU’s Common Agricultural Policy to the test as well. These objectives can only be approached by re-aligning agricultural policy with all sustainable development goals. The EU is faced with the task of harmonising different policies, identifying and addressing trade-offs between individual goals and fleshing out the implementation process with adapted solutions.